notification is for the available 275 Posts. 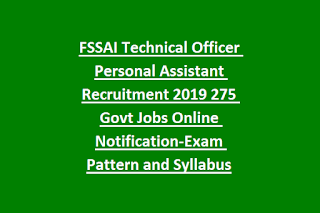 FSSAI Technical Officer Personal Assistant Jobs Recruitment 2019 is through CBT, written exam and skill test/interview wherever required. FSSAI vacancies online link will be active from 26-03-2019 to 25-04-2019. FSSAI FSO jobs Notification official website is www.fssai.gov.in. 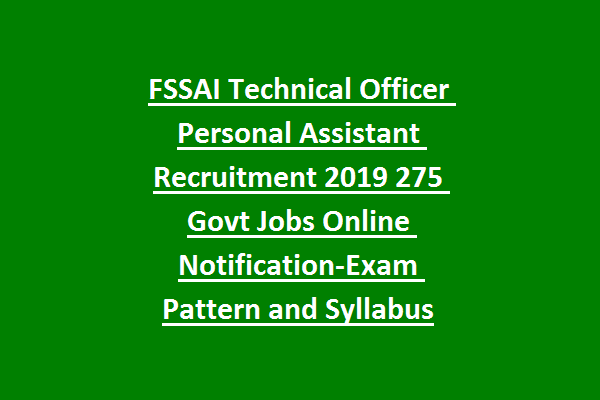 FSSAI Technical Officer Personal Assistant Recruitment 2019 Exam Pattern and Syllabus, Online Form process, CBT Exam date, Written Exam date, hall ticket/admit card available date, age limits, qualification and more details of this FSSAI Technical Officer Personal Assistant Recruitment Exam 2019 is updated below. There are total 275 vacancies in this FSSAI Recruitment 2019 Notification. For Sc/ST candidates 5 years and OBC 3 years, PWD candidates 10 years of upper age relaxation will be given. For FSSAI posts written exam will be held in various stages. Apply online for this FSSAI FSO jobs through www.fssai.gov.in website. Last date to apply online is 25-04-2019. FSSAI posts Exam Pattern and Syllabus, Technical Officer Personal Assistant CBT Hall ticket available date, FSO CBT exam date and other details of FSSAI FSO recruitment will be updated in this website only.